My name’s Emily Berenstain, I’m the granddaughter of Stan and Jan Berenstain, and the daughter of Michael Berenstain. I wanted to take a minute to clear up a few things about the books and debunk some myths about our last name. People have questioned the pronunciation of my last name since I can remember. It’s not a name you hear every day. Many people would ask me, “It’s BerenstEIN, like the Bears right?” to which I would respond “No it’s actually BerenstAIN, like the Bears”. It was never a big deal when people got it wrong, I would just chuckle and correct them, a simple mistake. But then this last summer for some reason the fact that our name was spelled “Berenstain” and not “stein” got brought up again and again and people took to the internet in frenzy! It was pretty funny at first, seeing how upset people were that they had remembered the Bear Books incorrectly. “It’s Berenstain? Not Berenstein? My whole childhood is a lie!” I remember seeing someone’s comment on Facebook. Everyone started asking me about it, friends of friends, coworkers, long lost classmates from elementary school. It was getting kind of crazy! The internet presence grew and grew until it was trending on Facebook! Even a few celebrities commented on Twitter about it. Some people would not accept the fact that they had been pronouncing the name incorrectly for so long. I even saw pictures online where people photo shopped the name to “Berenstein”, it was ridiculous! There were many different theories circulating the internet about our name, some believed we changed the spelling on purpose (why on earth would we do that? ), and then a few believed in the Mandela effect. According to the Mandela effect, a parallel universe exists aside of ours where the books are indeed spelled “Berenstein”. My response to that theory is, who knows maybe there is another universe, who am I to say there isn’t? But in this universe, the Bears are and have always been the Berenstain Bears. ← Back to School Poems! I think that’s ridiculous! I always thought it was Berenstein bears too, but I assume that’s because of the telephone effect. People get sloppy and start saying it incorrectly and then blame the person at the beginning as having changed it. I will be making a point of saying Berenstain from now on though, just to make sure. I just wanted to say a big merci to the Berenstain family! In this tumultuous and often rapid world of ours which can bring tough stress, your books can do as much relaxation that mindfulness. Also, we can all see that society leans towards coming back to some simpler times and clean humor and a balanced positive moral compass. The Berenstain Bears do that. I might have been born in France, and all my little family is British, but the more than twelve years I previously spent in the USA taught me grit, honor, to not give up and family values. Your books helped very much our family when we had some hard life trials. Never underestimate the huge holistic value of your books which can ease any hard days people have. At last but not least,paper books are cool because, unlike some Apps or E books which goes on a phone or tablet, it is not probability wise exposed to spam, bugs, malware or hackers. By the way, I bought the audio “The Bears’ Picnic And Other Stories” in a digital for as a MP3 and it is a joy to listen when one wants to relax for a few minutes. The Berenstain Bears website is cute and user friendly and that is stratofab indeed! There are a few folks I respect and admire from the USA who made the world better, from Stan Lee to Huell Howser and Joan Ganz Cooney, who praised me for my altruism. I so can add your family as inspiring me and many. 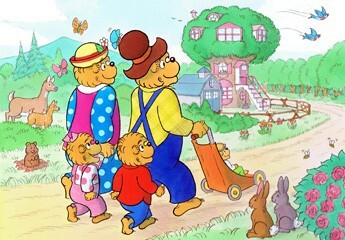 Thank you for being part of uplifting families with holistic values and fun with the Berenstain Bears. If I would ask for an honor to be granted to me, it would be to meet you one day! You guys ought to visit Great Britain and promote your positively minded books.